What President Was an Avid Golfer? Barak Obama and Bill Clinton share Dwight D. Eisenhower's passion for golf. Many U.S. presidents were avid golfers, but few topped Dwight D. Eisenhower's enthusiasm for the game. Eisenhower, who was president from 1953 to 1961, played more than 800 rounds during his eight years in the White House, according to Links golf magazine. On average Eisenhower played more than 100 rounds a year -- about twice a week. Eisenhower played often at Augusta National Golf Club, where he held a membership, according to Links. Augusta National hosts the Masters each year and is one of the most exclusive golf clubs in the world. Links estimates that Eisenhower played about 25 rounds a year at the club, which is located in Augusta, Georgia. Overall, Eisenhower spent more than 1,000 days on golf courses while he was president, according to Golf Digest. Eisenhower did not seriously take up golf until he was in his 40s, according to Golf Digest. He reportedly established an 18 handicap while at Augusta National, meaning he typically would score in the 90s or 100s, although Golf Digest reported in 1964 that Eisenhower once scored rounds of 77 and 79. Golfing great Arnold Palmer, who got to know Eisnehower, told Golf Digest that the president clearly loved the game and acted like a "regular guy" while playing. In between trips to Augusta National, Eisenhower would practice on the South Lawn of the White House, according to Golf Digest. He would also play some rounds at Burning Tree Country Club in Bethedsa, Maryland -- a quick drive from the White House. At Burning Tree, Eisenhower would play with a host of dignitaries, including generals, senators, and his vice president, Richard Nixon. Eisenhower's passion for golf was interrupted by a heart attack in 1955. He also suffered from intestinal problems in 1956 and a stroke in 1957. When he was healthy he was often on the course, once playing 18 days in a row, according to Golf Digest. U.S. presidents since Eisenhower haven't come close to playing as much golf as he did, but several of them loved the sport. Links asserts that John F. Kennedy could have been a single-digit handicapper if he had more time to play. Gerald Ford reportedly once hit a longer drive than playing partners Gary Player and Arnold Palmer. Bill Clinton is known to love the sport but playing partners often joke about Clinton's penchant for mulligans. George H.W. 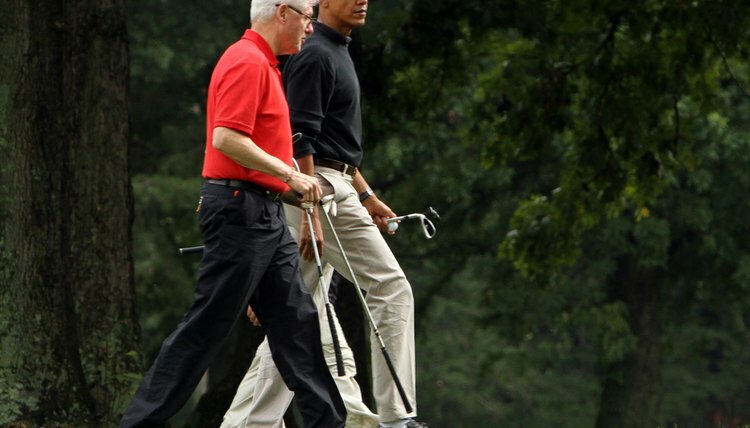 Bush and George W. Bush are golfers, as is Barack Obama. Which U.S. President Loved Golf? What Politicians Have Golfed With Alice Cooper? What PGA Player Won Twice in 1980 After Not Winning Any in 1979? What Golfer Holds the Record for the Most Consecutive Tournament Wins? What Golf Items Does Ben Crenshaw Collect? What Is Natalie Gulbis' Home Golf Course?